New York City mayor praises police, FBI: "We have to constantly be vigilant"
NEW YORK (CNN) -- Four men were indicted Tuesday in what prosecutors said was a plot to bomb two New York City synagogues and fire surface-to-air missiles at U.S. military planes. 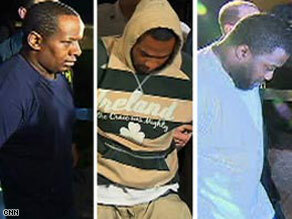 Three of the four suspects in the alleged synagogue bombing plot are shown after their arrests. The defendants -- James Cromitie, 44; David Williams, 28; Onta Williams, 32; and Laguerre Payen, 27 -- were charged with conspiracy to use weapons of mass destruction within the United States, conspiracy to acquire and use anti-aircraft missiles and six other counts. They face a maximum penalty of life in prison. Arraignment is scheduled for Wednesday. The plot was uncovered in a yearlong investigation involving an FBI informant. It ended with federal agents and New York police used an 18-wheel truck to block a vehicle carrying the suspects after they planted what they believed were explosive devices in cars near the synagogues, said New York City Police Commissioner Raymond Kelly. The planted devices were actually duds. The four are accused of plotting to detonate explosives near two synagogues in the Riverdale section of the Bronx and seeking to fire missiles at planes at an Air National Guard base. Kelly described the plot as homegrown, with no known links to any foreign or domestic groups. At a court hearing on May 21, U.S. Magistrate Lisa Smith ordered three of the suspects -- Cromitie, David Williams and Onta Williams -- to remain in custody without bail. Prosecutor Eric Snyder described the suspects as violent men "eager to bring death to Jews." At a later hearing, the fourth suspect -- Laguerre Payen -- also was remanded without bail. Payen received medical treatment for injuries during the arrest and had a bandage over one eye at his hearing. Payen's lawyer told the hearing that her client had a history of mental instability, but Snyder, the prosecutor, said videotapes of the plotters showed Payen to be a coherent and willing participant. Payen told the judge he has prescriptions for drugs used to treat depression and conditions including bipolar disorder. Cromitie, David Williams and Onta Williams are U.S. citizens, while Payen is Haitian, according to the New York governor's office. Mayor Michael Bloomberg praised the work of his city's Police Department and federal authorities in uncovering the alleged plot. "The good news here is that the New York Police Department and FBI did exactly what they're trained to do and prevented what could have been a terrible event," Bloomberg said. "We have to constantly be vigilant." "Unfortunately, this is the world we live in," said Nurit Bacharach of the Gan Miriam Early Childhood Center at the Hebrew Institute in Riverdale. "We just have to forge ahead and keep a positive mind and live life and just be cautious and aware." According to state and federal authorities, an FBI informant met with Cromitie in June 2008 in Newburgh, New York. During that meeting Cromitie said his parents live in Afghanistan, he was angry about the U.S. war there and that he had an interest in "doing something to America." The four suspects began meeting with the informant at a home equipped with concealed video and audio equipment, plotting to bomb the synagogues, authorities said. The suspects also conducted surveillance, including photographs, of an Air National Guard base where they wanted to blow up planes, authorities said. The informant provided the men with a surface-to-air guided missile and C-4 plastic explosives, none of which could actually be used. "No one was at risk," said Kelly, the police commissioner, describing the explosive devices as duds created to dupe the suspects.